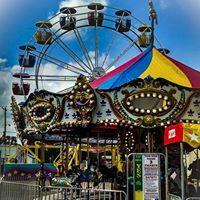 Bringing out the kid in everyone: The Pride of Texas Carnival! The Pride of Texas Carnival has new rides to ride this year; which will make you want to buy a $25 bracelet for your child so they can ride the rides all night long. They’ve got “Oooo’s and Awww’s” for the tikes and the thrills and chills for the “big kids”. Just remember to ride the rides FIRST, then go for the church lady food, it’s safer for everyone that way. They’ll be open every night of the Fair from 6:00-11:00 p.m.
Pre Sale ride bracelets are available through July 17th for the discounted price of $20.